We celebrated Dean’s first birthday Saturday. He was born 1 year ago about 2 1/2 months premature. He’s been a real fighter and is doing great. Guess he really loved the cake. I have had some friends and family ride the the zip lines at Silver Streak Ziplines in Wallace Idaho. They have all reported its a blast and have had a good time. The courses with heights up to 300-400 feet above ground and elevations ranging from 3,349 – 3,3778. Maybe one day I’ll give these a try. Attended San Diego Supercross (San Diego 2). Great event. Ryan Dungey was the event winner at Round 6 of the Monster Energy AMA Supercross season at Petco Park in San Diego, California. Dungey jumped out to an early lead in the 450SX Class Main, grabbing the SupercrossLive.com Holeshot Award. The defending Champion rode out front unchallenged for 20 laps to take the victory in a generally processional race. Here are some photos from practice. 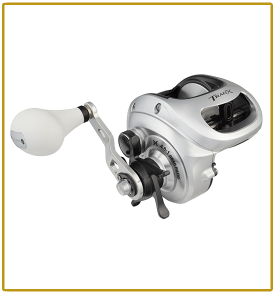 Bought this reel for fishing this summer. I’ve been reel satisfied with it. Here’s some more information on it. Theresa and I attended the Dana Point BBQ event. Great food and judging the entries was a lot of fun. We had some very good BBQ that day. Well, Finally broke down and bought the Green Mountain Grill – Jim Bowie Model. Bought it from Simi Pellet Grills. I strongly recommend this company. The will get you set up with what you need and treat your fairly. Keep posted and we will see how things turn out. The Jim Bowie model comes with a digital control, a meat probe, a peaked lid for stand-up chicken/ large fowl/ rib racks, a convenience tray with utensil hooks and hard rubber tires. Also included is Sense-Mate, a thermal sensor which constantly monitors the ambient temperature. When it gets cold outside, it kicks the grill into Turbo mode so you don’t have to wait long for the grill to heat up! You’ll also get a venturi-style firebox for cyclone combustion, front casters, a positive pressure hopper fan to prevent burn-back, a dome thermometer and “fan only” mode with automatic grill shut-off to blow ash out of the firebox after you finish grilling. The stainless steel grate measures 37.5” X 16” (600 sq. in.) and the inside clearance is 13.5”. It weighs 183 pounds.